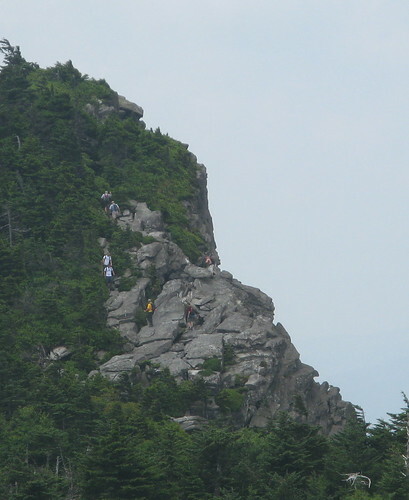 I’ve proved beyond doubt that Grandfather Mountain is no place to hike if you’re in a hurry. I’ve established a firm 1.1 mph pace after five outings totaling about 25 miles. Sign for the Profile Trail, seen heading north on Highway 105. And half of that was downhill. Profile Trail proves the point: It’s 3.5 miles to Calloway Peak with 1,900 feet of ascent — hardly formidable stats for experienced hikers. It even gets off to a very sane start: the first two miles are all uphill, but not grueling. 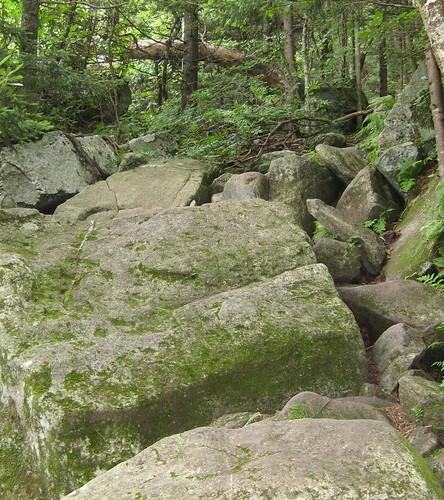 Grandfather Trail, the route across the mountain’s highest peaks, is the best in the park. Despite the intimidating ladder climbs and cable descents, it’s one of the most rewarding hikes I’ve ever done. Only downside: you pay $15 per person for the privilege of parking close to those trails (the fee preserves a priceless local treasure, but I’m a slave to anything free, hence my four visits to the free trailheads — Profile Trail off Highway 105 and the Boone Scout Trail route from the Blue Ridge Parkway). 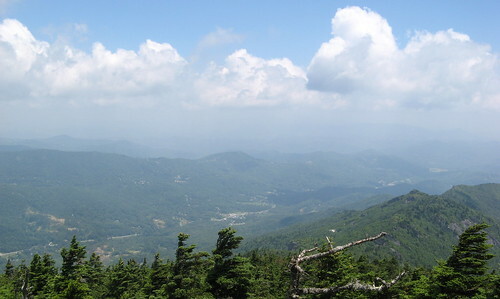 Distances at Grandfather are beguilingly short — Grandfather Trail is just 2.5 miles from the Swinging Bridge to Calloway Peak — so thrifty newcomers might assume they can do the whole mountain from a free trailhead. After all, what’s another five miles after the mountain’s been climbed? Depends on how much energy — and time — you have. That five-mile out-and-back on Grandfather Trail could take five hours. And if you go much faster, you defeat the point of being up there. 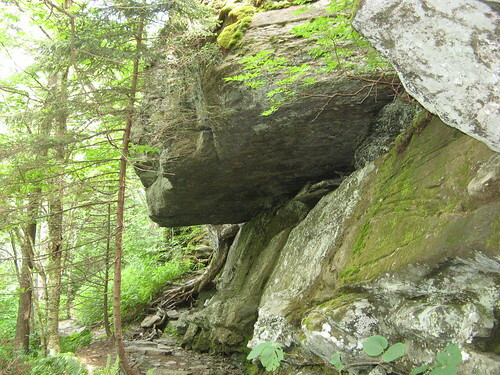 OK, on to Saturday’s hike: it’s very basic: Start on the Profile Trail from the parking lot off Highway 105 north of Linville Falls. It’s about three miles to Calloway Gap, where a left turn and another .4 miles of climbing goes to Calloway Peak summit. If you’re feeling friskier, take a right and head over toward MacRae Peak; just don’t lose track of time, especially if you get a late start. The trail is unblazed, but there aren’t any side trails to speak of. Blue arrows have been nailed to the trees in some of the areas where the trail is a bit hard to follow. What say we look at the pictures? 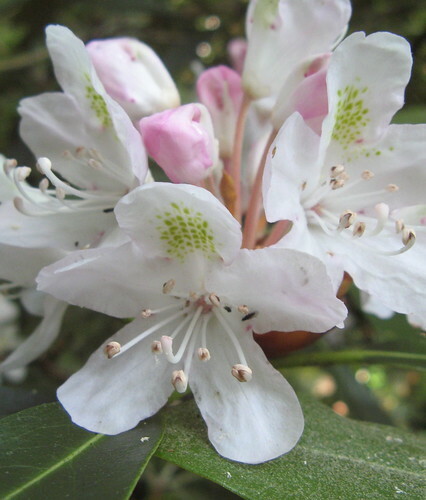 Isn’t this a rhododendron? If so I didn’t realize there were white varieties. These were at lower elevations, up to about 4,500 as I recall. I’m guessing the red/pink ones are gone up and down the range by now. 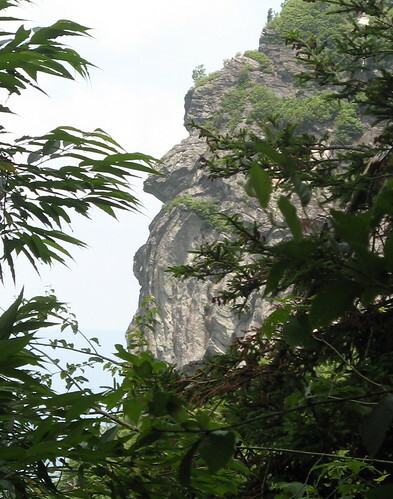 These amazing stone faces are one of the best features of this hike. There are several on the way up. 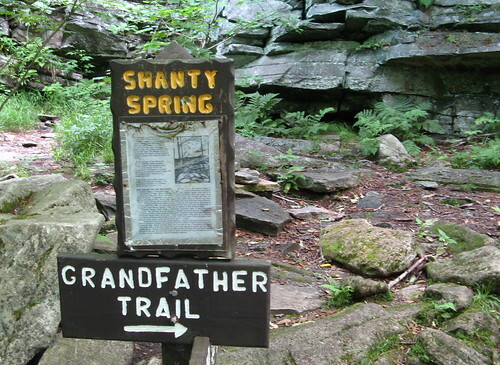 Shanty Spring is a campsite with a spring — actually a small pipe with a trickle of water coming out. There are lots of places to camp on the mountain, but water sources are rare. After Shanty Spring the trail gets very gnarly. Like this, for instance. 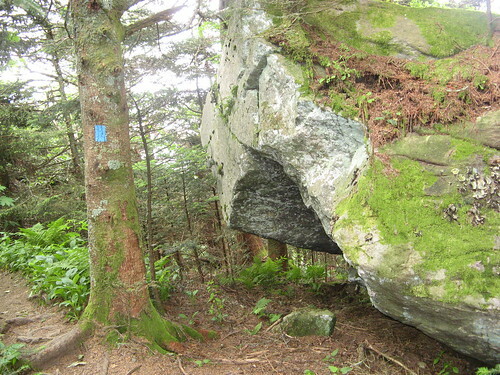 Along this route, if you’re wondering where the trail is, just follow the boulders and the blue arrows. Eventually you get to Calloway Gap, and where it’s .4 of a mile to Calloway Peak. Another cool stone formation along the way. Here’s a little overlook offering a view of the mountain’s other peaks. At the next major trail junction, the sign points left for Watauga View (100 feet), or right for Calloway Peak (.1 mile). A short ladder shows up pretty soon, and comes out over a small rock outcrop. There must’ve been a half-dozen people crowded on this rock when I got there. I noticed a blue blaze over the to the right and followed it — there are two more ladders on the way to the trail’s terminus. Pretty good view for this time of year. Here’s one of those ladders. The layers of rock are workable steps up to the ladder’s base. OK, back down the way I came. 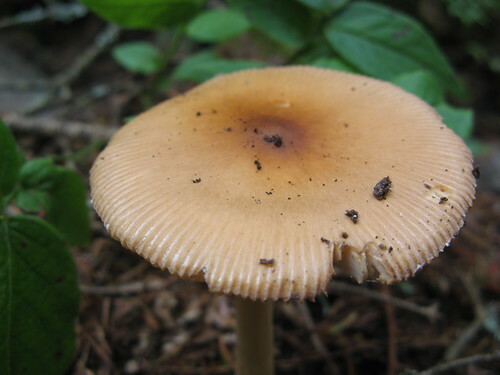 Lots of mushrooms along the forest floor. Long-range zoom shot of a bunch of hikers over at MacRea Peak. It gets busy on a Saturday here. More flowers. These look sorta like a mountain laurel, except for the yellow. Yet more groovy rocks on the way back down. This is Profile View: See the forehead, nose and chin? 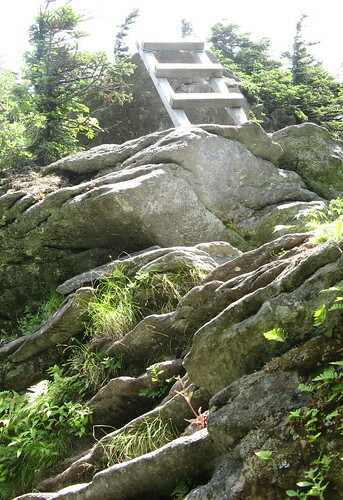 This stone formation is one of the competing explanations for why the the hill is called Grandfather Mountain. So those are the highlights of Profile Trail. Not a lot of views on the way up, though it’s probably awesome on a clear day in November, when the leaves are gone. 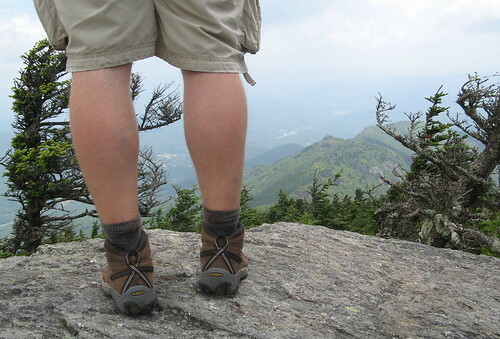 Awesome report once again – I enjoy your Grandfather Mountain adventures. But you’re right, hiking is not meant to be done in a hurry. That’s what trail running is for. 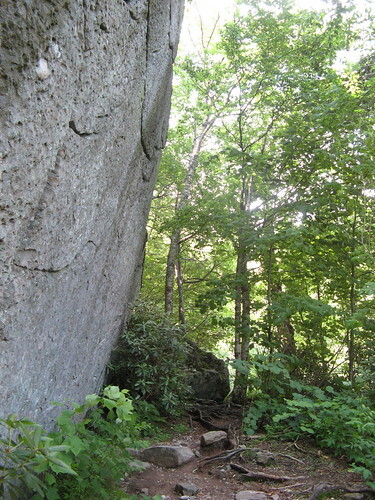 I love the NC mountains, the mossy rocks, the flowing streams, the green tree canopies, and also the dreaded boulder fields. Sounds like you had a great time out exploring Grandfather Mnt. and you went slow enough to notice the flowers too. Great photos, as always. 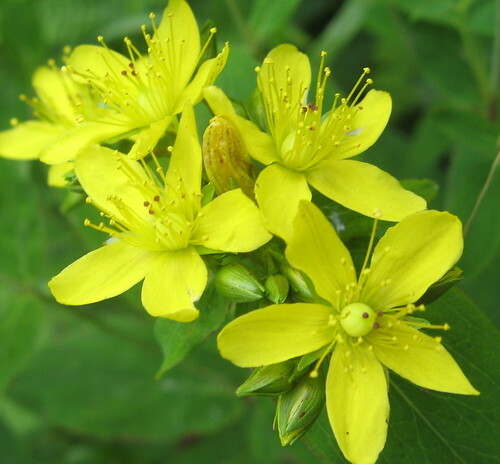 The yellow flowers are St. Johns Wort. My boyfriend and I just sold everything, bought an annual National Parks pass and are traveling the United States! I’m going to subscribe to your blog- it’s awesome – hopefully you want to subscribe to mine too! 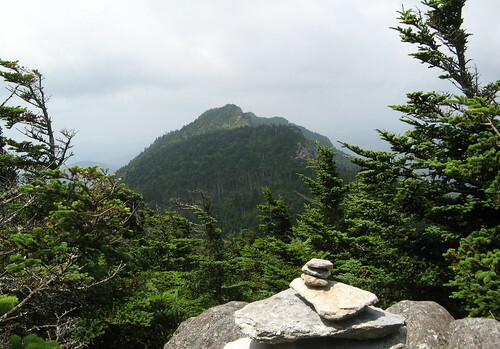 not trying to bust your balls but the so called “Boy Scout Trail” you mentioned is actually called the “Daniel Boone Scout Trail” and if you get the chance to do that one sometime, its awesome especially when you start gettings towards Calloway Peak.